Israel is “playing with fire” with a proposed law to prevent mosques from broadcasting the Muslim call to prayer via loudspeakers, Hamas leader Khaled Masha’al said. Masha’al joined the Palestinian National and Islamic Forces – an umbrella organization which includes the various factions within the Palestinian Authority – in condemning the proposed “Muezzin Law” which the organization said would constitute a declaration of war by Israel. The draft legislation has also sparked outrage among Arab Knesset members, with member Ahmed Tibi (Joint List) last week calling on the Arab public to disobey the law should it pass. “I call on all my people to disobey this law until it reaches the third reading and is approved. We are also disturbed by the Friday and Saturday sirens (announcing the Shabbat), we too cannot travel on Yom Kippur and festivals because of you, but we don’t speak about it, we don’t protest,” he said. 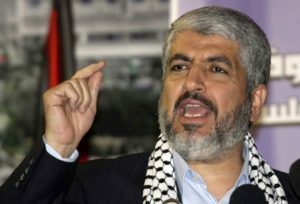 The Hamas leader also called on U.S. President-elect Donald Trump to change American policy in the Middle East and not follow the path of his predecessors. “The American president, be it Trump or someone else, will discover the truth, and that is that Israeli stubbornness alone does not dictate reality,” Masha’al said.